Have You Ever Experienced A Pet Loss? or any departure of a loved one? 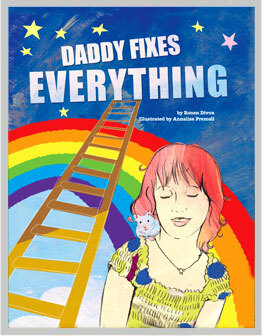 Daddy Fixes Everything provides children and their parents with tools to cope with departure and loss; so doing in language and register that are age-appropriate. The story introduces a father who is ever-busy fixing broken toys and household sundries while surrounded by his children’s commotion. All is well until one child (Danielle) discovers that the pet hamster is not moving. Figuring dad, who can fix just about anything, can fix the hamster as well; Danielle arranges a rescue operation, only to find out that resurrection is not included in the father’s repertoire of skills… The story then takes a different tone as the family, particularly the children, presented with the first-time experience of facing death and its emotional ramifications, must come to terms with the passing away of their pet. It is a unique story, in approach and its related rewards. As a classroom teacher for grade school children and a lover of picture books, I can honestly say that this book is high on my list for dealing with the loss of four-legged friends, or anybody for that matter. Ronen's honest and spiritual take on life and death are approachable for all children and adults of any religious or cultural background. It would be a great asset for any parent, classroom teacher, social worker or child psychologist. The illustrations are warm and inviting and create a space of beauty to showcase the true nature of life, that which passes but leaves an impact on our hearts. This book sheds so much light on a subject that should not be kept in the dark. Thanks, Ronen and the entire Divon family for sharing your story! Click here for more review. Dr. Lonnie Kasman of Monroe Animal Hospital provides young owners of pets he needs to euthanize with a copy of Daddy Fixes Everything to help them cope with their beloved pet's departure. Natural Awakening Magazine, June 2011 Edition. Blog entry at Parashakti's Web Site. Tune in to the internet radio show "Connections with Deborah Turner", hosting Ronen. Click here for the program's archive file of the broadcast. Reading events are being scheduled. Please contact us if you are interested in attending an event or would like to organize one in your area.